Are enhanced textures and new motion controls enough bring an old 3DS series back from the grave? Find out in our review. Resident Evil has made its Nintendo Switch debut, and though that's something we'd normally be very excited about, in this case the Switch's reputation as a port machine is holding up true. 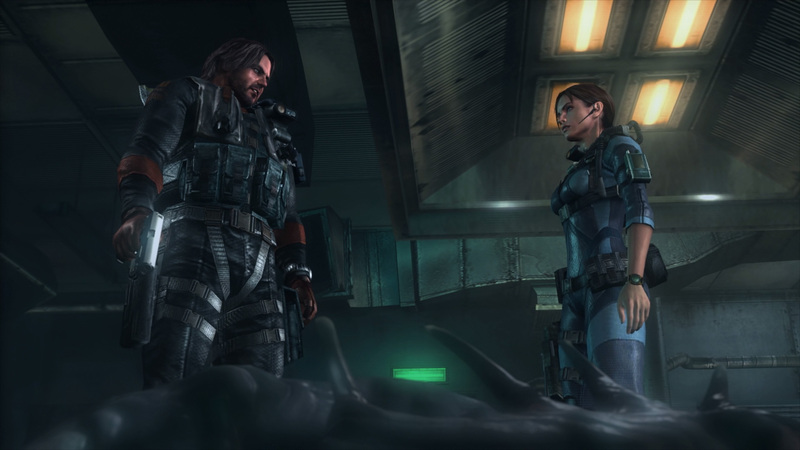 Resident Evil Revelations, both games 1 and 2, are enhanced versions of the titles that landed on the Nintendo 3DS in 2012 (in the case of the original Revelations) and the episodic Revelations 2 adventures that graced various consoles 2015. And though they certainly look and play well enough, these aren't modern Resident Evil games by any means. With that said, they do look and feel about as good as they ever have, and the Revelations Collection presents a bang-for-buck value that easily surpasses many other Nintendo Switch titles, ports or not. The original Resident Evil Revelations hit the Nintendo 3DS scene way back in January of 2012. Though that might not seem like a very long time ago, it's worth remembering that Nintendo didn't launch the Wii U until November 2012 — or, in other words, Revelations is a game that rose to prominence when the original Wii was still the primary Nintendo console. It's a pretty old title, but with that said, it has held up surprisingly well. Through a number of other ports to systems like the Wii U and PlayStation 4, Revelations has picked up its fair share of high-resolution textures and an overall increased resolution, and the bulk of those updates remain true in the new Nintendo Switch version. However, Revelation's origins as a 3DS title do remain fairly obvious: it follows the same sort of over-the-shoulder third-person action that the series popularized back with the release of Resident Evil 4, and the game is broken up into bite-sized chunks that make it easier to digest on-the-go. Admittedly, these are good qualities; modern touches like dual-stick movement and aiming make Revelations about as easy to control as any modern shooter, and the episodic nature of the game is particularly well-suited to the Switch's portability. The game even has short cutscenes before each chapter showing highlights of the previous chapter, meaning players won't ever be struggling to remember where they stand in the overall narrative. The Nintendo Switch versions of the games are also enhanced with Switch-based motion controls: players can opt to use the system in Handheld mode or don disconnected Joy-Cons in order to aim their weapons simply by pointing the controller in the direction of enemies, much like the motion control used in The Legend of Zelda: Breath of the Wild. We found this method of aiming to be clumsy at best, however; aiming in either title is fairly imprecise perhaps out of design, and adding in the extra time needed to square up shots only seemed to make enemy encounters more frustrating. If you're planning on playing through these games as efficiently and with as much aplomb as the original platforms, you'll no doubt want to adopt a Pro Controller for your time with them. Some say this negates the point of playing on Switch, but if you've ever felt the heft of a Pro Controller in your hands, you'll feel right at home here. The original Revelations follows two interconnected stories: the first sees series mainstay Jill Valentine and new partner Parker Luciani investigating the disappearance of BSAA members Chris Redfield and Jessica Sherawat on board the cruise ship Queen Zenobia out in the Mediterranean sea. The other side of the tale follows staple Resident Evil protagonist Chris Redfield and partner Jessica Sherawat as they investigate what appears to be the return of Veltro, a terror organization that used genetically-modified creatures (i.e. classic Resident Evil bio-weapons) to wipe out an entire city. Players take control over both Chris and Jill at various points in the game, though the bulk of Revelations follows the perspective of Jill and her exploits aboard the cramped ocean liner. The Queen Zenobia is one of most praiseworthy elements in the first Revelations. Though the cruise ship's inspiration might have been drawn from the 3DS' relative inability to render large environments, the Queen Zenobia makes for an ideal survival horror set, being cramped, dark, hard to escape from, and home to loads of port holes and ventilation systems for monsters to slither out of. It keeps tension high, which is great for Jill's story segments; however, the tension out at sea makes Chris' more open-environment chapters feel substantially less tense. 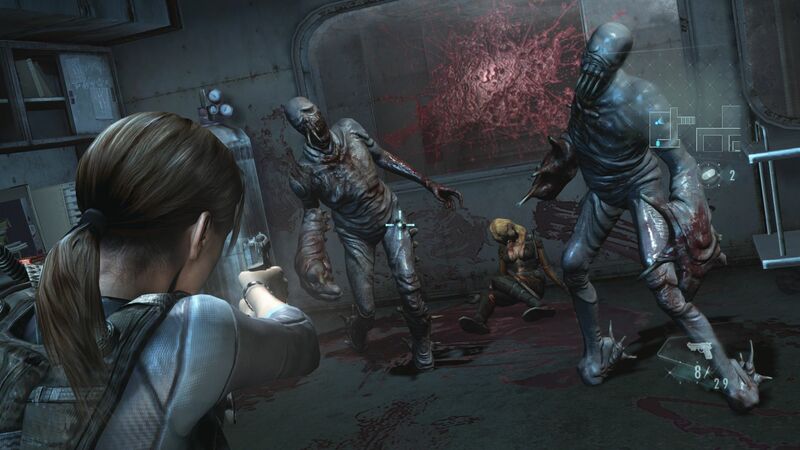 Both titles in the Resident Evil Revelations Collection also offer access to the Raid gameplay mode, which presents a co-op experience not entirely unlike the Mercenaries gameplay mode that debuted back in Resident Evil 5. Players can make their way through some of the game's environments with a focus on killing enemies, collecting items, and racking up points. Even better, the Raid mode offers up its own individual progression system where players can gain experience and unlock various equipment and bonuses. Beyond Raid mode, one important staple of the collection is its optional multiplayer campaign settings. It's no secret that much of the fun that can be found within modern Resident Evil releases lies within multiplayer modes, as exemplified with the Chris and Sheva pairing of Resident Evil 5. Playing through the campaign via local split-screen multiplayer is an added boon, especially if you tend to feel relegated to navigating horror games in single-player mode most of the time. While your partner may have the lesser experience, it's still a lot more fun to trek through the game with a friend than it is alone, especially when you share the chills and thrills peppered throughout. Both Resident Evil Revelations and Revelations 2 are being offered in the Resident Evil Revelations Collection which retails for $39.99. The package includes the first Revelations on a cartridge as well as a download code for the second Revelations game, which might be a little disappointing for those who prefer physical releases. Both games do present good value, however, as there are plenty of current Switch games running the exact same price with far less content and replay value — we're looking at you, Super Bomberman R.
Players with a number of games installed on their Switch systems will also want to be aware of these games' file sizes: Resident Evil Revelations weighs in at just over 12GB, while Revelations 2 comes in at nearly 24GB. Together, they account for around 8GB more data than a standard Switch can accomodate, so be sure to have those microSD cards handy. The Nintendo Switch is sorely lacking in horror titles, and the Resident Evil Revelations Collection is a welcome addition to the console's library. If you're looking to expand your horizons or simply get your start in the horror genre on your shiny new handheld, you could do way worse than this double shot of high-octane zombified horror game. It's not the classic Resident Evil adventure you may remember from your original PlayStation or GameCube endeavors, but it's certainly a worthy buy, motion control issues and all. Plus, it's been on nearly all consoles by now. You may as well bring it home on Switch too! Interesting new modes and multiplayer addition. Translates well to the Switch. Large amount of storage space required.